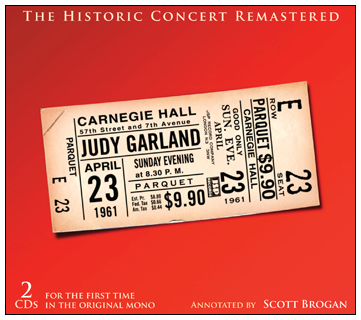 JSP Records’ deluxe release of the original album version of “Judy at Carnegie Hall” is now available. This is the premiere release of the original album version on CD. The LP version was the only version available for over 25 years and is what several generations of Garland fans grew up with until the CD age brought us the release of an abridged version followed three expanded editions (1989, 2000 & 2001). The CD set is available from Amazon.com UK and from Amazon.com US . Note that it’s cheaper to purchase through the UK site even with shipping. The Amazon US price is a steep import price. It is also available for digital download on Amazon.com UK. Note that this is the release that won the five Grammy’s and kept the concert’s fame alive for decades. It’s a perfect complement to the expanded versions released in 2000 and 2001. The video is so nicely done. Thank you. One small note: The JSP Carnegie Hall is being released on the same day as the Blu-ray of the 1937 version of A Star is Born, starring Janet Gaynor and Frederic March and directed by William Wellman. I thought the CD of the uncut version came out in the states about 10 years ago. Is there even more I missed? It did. The JSP set is the remastered mono LP version that came out in 1961. It is the version that won all the Grammy Awards and thrilled listeners up until the 1989/2000/2001 releases of the expanded version. The original album version has never been releases on CD, until now.